Remembering the birthdays of your social-media friends should get a little easier with Monday’s update of Ascii Studios’s Reminder Pro application. 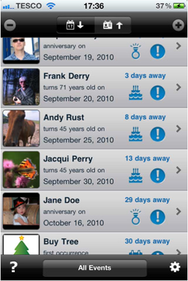 Reminder Pro 2.0 adds the ability to import birthday notifications from Facebook or the iPhone’s Contacts database. The new version also lets users import contacts with birthday and anniversary from the Contacts application and into a dedicated database. In addition, it sports an updated UI, compatibility with the iPhone 4’s Retina display, user icons for contacts, and photos for custom events. The app, which bills itself as “the most comprehensive birthday, anniversary and event reminder” available, also uses iOS 4’s Local Notifications to send you reminders; that way, contact information is not shared or uploaded to the Web. To keep your info secure even when it's on your device, you can also enable a PIN lock for the application itself. Reminder Pro 2.0 costs $2 and works on any iPhone, iPod Touch or iPad running iOS 3.0 or later.